In case you’ve had an inkling to start your own YouTube channel or want to get into photography or blogging or creating an online brand, here are some helpful resources that I have used to create everything you see on this website and on my YouTube channel. But, before you venture any further, do know that this equipment and software list has morphed drastically since I first started. I firmly believe in waiting to upgrade equipment until you’ve proven to yourself that you’ll stick with it. It kills me when people spend their hard-earned money on equipment thinking that equipment is the answer to building a successful business. Good equipment helps, but only if you’re going to use it. I started shooting video with my iPhone and a video editing app and that’s really all you need in the beginning. Start small, be patient, know that photography, videography and blogging are skills that take a good bit of time and personal passion to grow. But, if you love it and you stick with it, you’ll be amazed at what you can do! Disclaimer: Please note that some of the links below are affiliate links and I will earn a commission if you purchase through those links. I use all of the products listed below and recommend them because I believe in them. Please let me know if you have any questions about anything listed below! I host my premium online content and Flash for Food Photography Course through Kajabi. If you’re looking to teach what you know and turn it into a new source of revenue for your business, they’re easy to work with a user friendly for students. 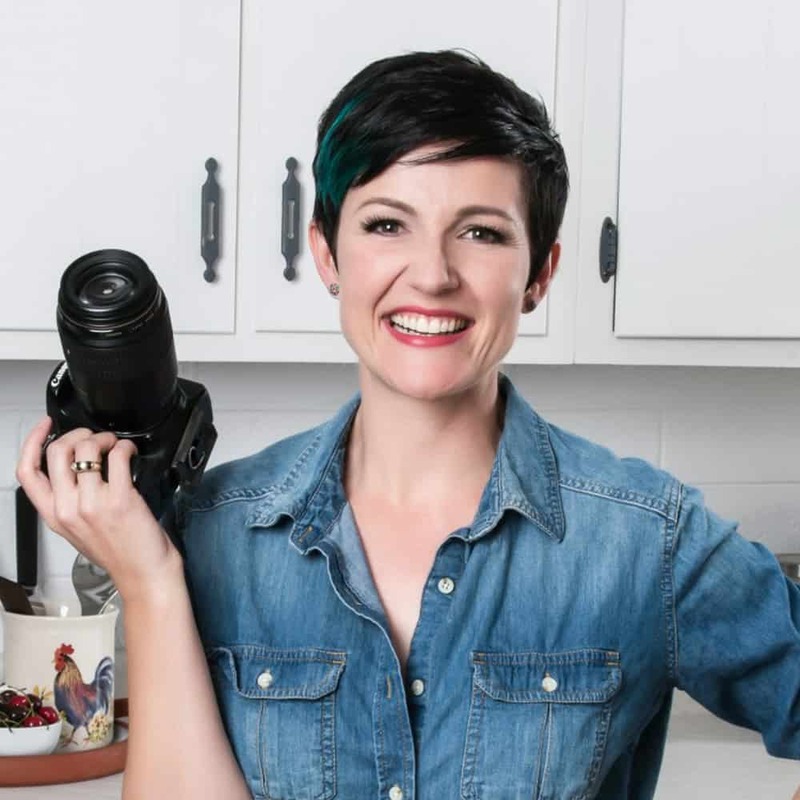 The Blog Village is the ultimate training resource for everything from setting up a website to photography to videography to social media to building a brand. I actively participate in their forums and learn from other bloggers in addition to help from the ultimate gurus in digital media creation. I continue to return to their tutorials on video editing and regularly use their smart tool for image sizing. The majority of my images (and YouTube videos on The Bite Shot) are shot with the Canon 5D Mark IV camera body, an upgrade purchased in November 2017. But, I built my business on the the Canon 70D . It’s great for video because of the flip out LCD screen to see what you’re shooting from in front of the camera. I also own a mirrorless Sony a6000 and a Zeiss 55mm 1.8 that is great for when I’m traveling and don’t want to have a big bulky camera. It’s also the camera I used on my first paid shoot. For handheld vlogging on-the-go, I use the Canon Powershot G7X and love it. It has anti-shake technology for handheld use, a flip up selfie screen for handheld vlogging and the picture quality is fabulous. The audio is great, too, when recording in normal to low noise. Though in a noisy area, it becomes hard to hear and voices get muffled. As far as lenses, I have added and subtracted over the years. Based on my personal style and how I shoot, I use three lenses. The Sigma art 50mm f1.4, 100mm Macro 2.8 and a 24-70mm f2.8. I sometimes use this Hoya Polarizing Filter on my Sigma Art lens. I have a whole video about filters on YouTube. When I shoot on location for clients, I bring this larger diffuser that also comes with a set of reflector covers. I also use this gigantic one which is great for spreading light softly all over your scene. As for standing them up, I either suspend them from the boom arm of a c-stand or clamp them to a light stand with A-clamps. Manfrotto MT055XPRO3 with Horizontal Column this tripod was worth every penny. I used a cheaper tripod for two years, which made sense at the time, but with the amount of time I spend shooting every day, it’s invaluable to have this rock solid piece of equipment that is also easy to adjust on the fly. Also has an extender arm to enable overhead shooting. You’ll also need a tripod head to mount the camera to the tripod if you don’t have one and this is solid while flexible. For travel, I use this lightweight travel tripod by Manfrotto that takes the same plates as my main tripod. I have a heavy duty c-stand that I use when I shoot overhead. If you want to attach a camera you’ll need this adapter. If you have the Manfrotto Tripod, it will also be helpful to get this monopod head which attaches to the adapter and uses the same mounting plates as the Mantrotto tripod head listed above. More questions about the c-stand, I have a video about it. I use this Laptop Stand for shooting tethered. Check out TetherTool.com for the right cord to connect your camera to your laptop. I use the Spyder 5 PRO for monitor calibration. I recommend the Spyder Checkr 24 for color correction. I go through a lot of batteries between my audio gear and my speedlights. I have this set from Eneloop which are high quality and quickly rechargeable. My continuous lighting kit that I use for video was discontinued and B&H recommends this Dracast set, a comparable (and lower priced) solution for continuous LED lighting. Jamie Windsor, whose channel I trust, recently reviewed this light which also looks like a quality solution. I utilize this giant diffuser to soften the light with the LED light and such will also come in handy for the Dracast set as well. I primarily shoot stills with flash. I primarily use the Godox AD600 Pro monolight with the XProC trigger included in the kit. I started with and recommend for beginners the Yongnuo YN560IV Wireless Flash Speedlite Master and the Wireless Remove Flash Trigger Kit is the Yongnuo RF-603C-ii-C3 (please note compatibility with your specific camera). You will also want the mounting bracket in order to affix the flash to a stand. I also have a Canon 600EX-IIRT speedlite with this speedlite transmitter. If you are not a Canon shooter or are looking for other flash options, I have a separate page dedicated to flash photography gear. I also have a in-depth online course that can teach you everything you need to know to start shooting food with flash. For quick chef portraits, I use this simple umbrella. As far as modifiers I use this strip softbox with the grid for moodier lighting or this square softbox for more general lighting use. I also have a large octagon softbox for super soft lighting. You will need a speedlight adapater in order to use these with a speedlight. You’ll also need a light stand for mounting it. For more general uses of the speedlite, I sometimes use this larger softbox. I also use this grid sometimes to direct the light. I also modify speedlites with this snoot kit for spotlight and focused light situations. For shooting drinks, I suspend a large 12′ x 48′ butcher paper from my c-stand. When I need to change the color of my speedlight, I use this gel kit. I like to have a wired remote switch so I can fire shots without being behind the camera. Be sure to confirm the specific connection required for you camera. I also have an extender cord so I can be far away for action shots. This is repurposed from my podcasting days, though has been a champ for me. I use the Zoom H6 handy recorder for most recording with a 16GB memory card that can hold several hours of recording. This means, though, that my audio and my video are recorded separately and I sync them up together in video editing. It’s an extra step, but the audio quality makes a huge difference. This is the kind of stuff The Blog Village can teach you. For mics when using a lavalier, I use the Audio Technica wireless lavalier system. I have two for when I have a guest. I use the Rode adapter to plug the lav receivers into the Zoom H6. For a mic when at an event or unable to use a lav, I use the Rode Go Shotgun mic. I use Adobe Lightroom for most image editing and occasionally touch up in Photoshop. Depending on the situation, I also use Capture One Pro. I own several backdrops from Erickson Woodworks but also for custom jobs, make my own. I also like the vinyls from Ink and Elm as well as Capture by Lucy. I currently use Adobe Premiere Pro for video editing and Adobe After Effects for animated titles. It’s important to have a contract in place to protect yourself and your work as a photographer. I use a contract from The Contract Shop. I’m sure there a bunch of other resources that I use that I didn’t list here. If there’s something you want to know about, just holler!